16x2 LCD PIONEER套件屏蔽 - Cypress技术论坛 - 中国电子技术论坛 - 最好最受欢迎电子论坛! After purchasing three Pioneer kits (early summer) I needed a better way to quickly prototype projects. This included having an LCD display and a breadboard similar to lot of the Cypress Kits like the CY310-PSoC EVAL1. I produce 12 PCB for personal use. 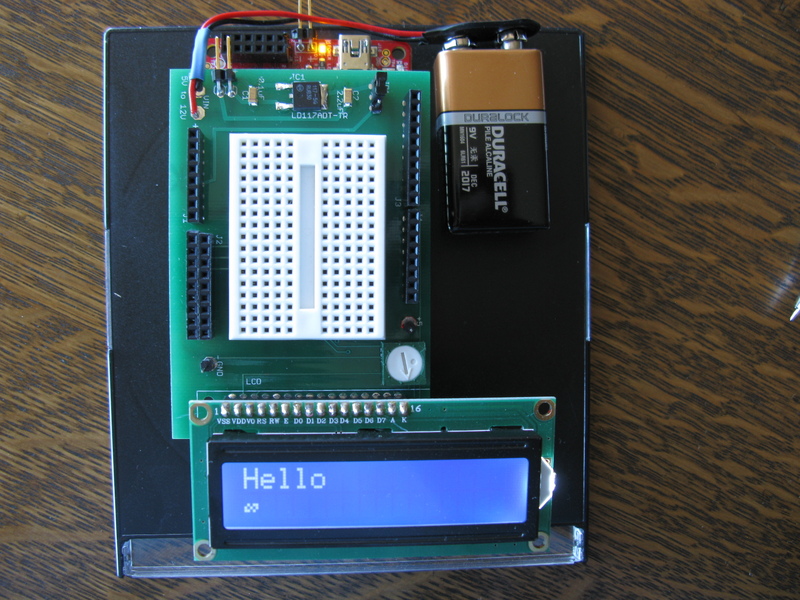 The PCB layout uses a separate voltage regulator, 16x2 LCD module using theHD44780 5V controller with lack light, and jumpers to select several ways to connect power. The shields can be configured to use a breadboard or wire wrap terminals. I’ve had no problems with LCD issues as indicated in thread CY8CKIT-042 PSoC 'ES'. The shield works with the LUMEX LCM SO 1602DSR/A LCD module (used in Cypress kits) with no back light. However, I have not tried it with a 3.3V module using the SPLC780D controller. That particular controller uses an extra 8 pin IC soldered on the back of the LCD board. Data sheets indicate that the SPLC780D controller is compatible with the HD44780. However, the power up timing/initialization may be different. See attached file of shield with breadboard. looks good. May be you can post the PCB design for other to use as well. GMT+8, 2019-4-24 02:02 , Processed in 0.160193 second(s), Total 44, Slave 37 queries , Memcache On.